When executed skillfully and artfully events can suspend reality. 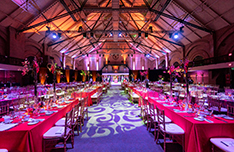 Venues transform from the mundane to the magical through décor, lighting and design. Strategic application of themes increases your brand's impact by applying it across attendee touchpoints. Maybe your goals are more whimsical. You have in mind an impression, an inspiration, or even just a color. That's all we need, our imaginations and abilities can fill in the rest, creating an amazing experience where every element contributes to an overall impression. "Corinthian came up with an amazing idea that was something we had never done before. The group LOVED the event, loved the philanthropic aspect and was completely enthused." 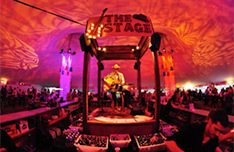 Keri Amundsen, Sunovion Pharmaceuticals Inc.
We love setting up gorgeous tented events in the rural fields of Massachusetts for Lovelane's biannual Hoedown. This year, the event evoked Nashville through performances, centerpieces, games, and so much more. 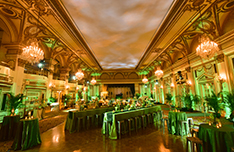 Unlike a traditional red carpet, guests entered the Fairmont Copley Plaza on rolled out lavish green carpets for "An Evening in the Emerald City." Walking into The Castle at Park Plaza, an expansive (14,642 square feet) National Historic Landmark, is impressive. The space is versatile, able to mold for the event from a conference, trade show, or gala.